CONVERSABLE ECONOMIST: When Will the Federal Reserve Raise Interest Rates? When Will the Federal Reserve Raise Interest Rates? Before the Great Recession, the primary tool for the Federal Reserve to conduct monetary policy was by altering the federal funds interest rate. As the recession got underway, the Fed started cutting this interest rate in August 2007 and by December 2008, it was down to almost zero percent, where it has remained. As the figure shows, the Fed consistently reduced interest rates during periods of recession (the shaded areas), but the Great Recession was the only episode during this time period where the economic contraction was so severe that the rate was taken all the way to zero. 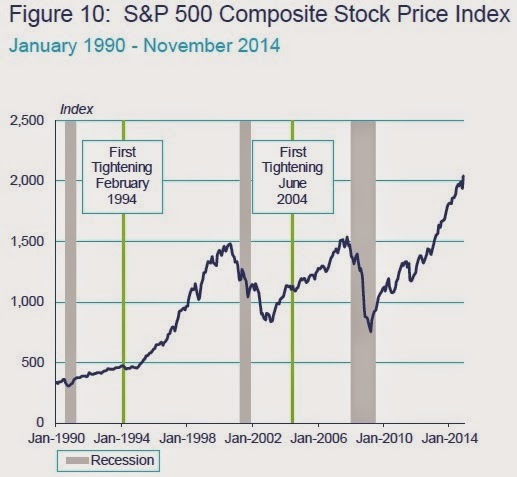 But the Great Recession ended in June 2009. The recovery, unpleasantly sluggish though it has been, has now been underway for more than five years. As we start 2015, an obvious question is when the Fed will raise interest rates. Eric Rosengren of the Federal Reserve Bank of Boston offers some insight about how the Fed is viewing this question based on comparing current economic conditions with the two previous times that the Fed acted to raise the federal funds interest rate in a substantial way: that is, the rises in February 1994 and in June 2004. First, the November 2014 unemployment rate was 5.8%. In June 2004, the Fed tightened when the unemployment rate was 5.6%. 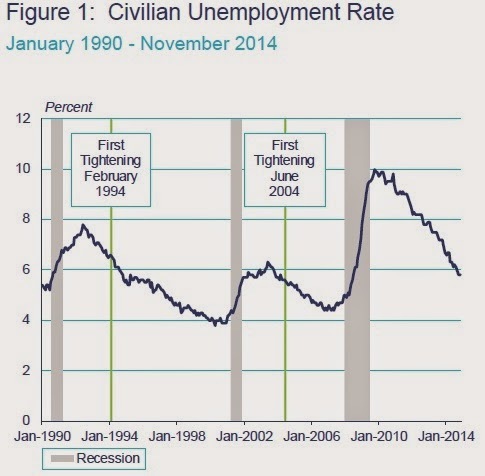 In February 1994, the Fed tightened with the unemployment rate was 6.6%. Notice that in both cases, the Fed acted to raise interest rates at a time when the unemployment rate was still falling--not waiting until the unemployment rate had bottomed out. The underlying argument here is that it makes sense to raise interest rates when the economy has a reasonable degree of forward momentum. What about inflation? The measure of inflation used here is based on the personal consumption expenditure index, which the Fed uses instead of the better-known Consumer Price Indes. 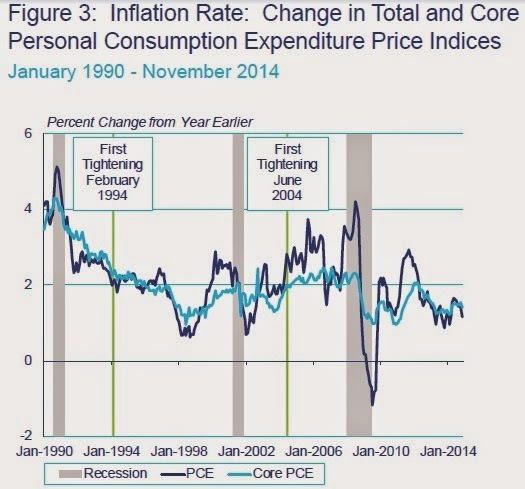 The previous two tightenings happened when the inflation rate was about 2%, maybe just a bit higher. The current inflation rate is closer to 1.5%. The lack of inflationary pressure means that the Fed can feel itself under less pressure to raise interest rates. What about economic growth? The 1990-91 recession ended in March 1991, so the tightening was a bit less than three years later, when growth had rebounded for a quarter to a 4% rate, and been re-established at rates above 2% per year. The 2000-2001 recession ended in November 2001, and the tightening came less than three years later, again after growth had rebounded to hit 4% for at least a quarter or two. 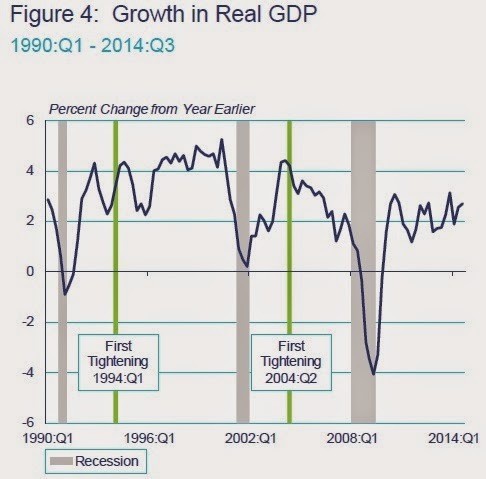 In the aftermath of the Great Recession, growth has not rebounded as quickly. However, the most recent GDP data suggest that the economy was growing at 4% or faster in the second and third quarter of 2014. Rosengren presented these slides at the meetings of the Allied Social Sciences in Boston on January 3. The panelists in the meeting didn't try to reach any specific consensus on the subject, but it's fair to say that several of them expect the Fed to raise interst rates later in 2015, but perhaps later in the year rather than earlier. Why wait? Part of the reason is to make sure that the preliminary figures showing more rapid GDP growth in the second and third quarter of 2014 hold up as they are revised. More broadly, given the sluggish pace of the recovery so far, and the continued low rates of inflation, there seems to be more reason to worry about raising rates too soon than there is about waiting a few more months. However, one sometimes hears a worry that the Fed should beware of raising interest rates because it might hurt the stock market. This didn't happen the last two times the Fed raised interest rates. Remember that the Fed seeks to raise rates at a time when the economy has solid forward momentum. Remember also that people investing in stocks are looking ahead at what is likely to happen, and investors have been well aware for some time that the Fed was likely to raise rates in 2015. The February 1994 and June 2004 rises in the federal funds rate left the stock market with more room to rise, and the same could well hold true this time. On the other side, there is a sense that US monetary policy has gone just about as as it can go, and it's almost time to start reversing course. For example, when the federal funds bottomed out in late 2008, the Fed started using a "quantitative easing" policy of purchasing Treasury bills and mortgage-backed securities to keep interest rates low. 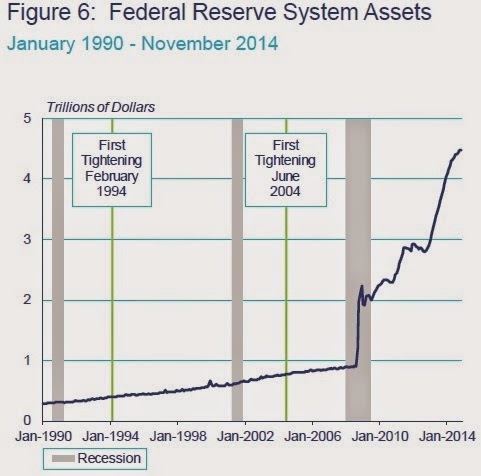 This build-up of Fed assets wasn't an issue during the two previous tightenings of monetary policy. But in October, the Fed announced that it would conclude its asset purchase programs. The current plan doesn't seem to be to sell off these securities, but just to hold them until they mature, and in that way to allow the Fed assets to decline gradually over time. There has also been concern that policies of ultra-low interest rates run a risk of creating other distortions in financial markets, as investors search for more lucrative returns. As one example, I wrote about potential issues in the leveraged loans sector a few months ago. Other concerns are discussed here, here, and here. Lower interest rates also create winners and losers: they obviously help borrowers, like the federal government, corporations that borrrow, and housing market, but they hurt those who planned on receiving higher interest payments, including pension funds, insurance companies, and older Americans. In the depths and turmoil of the Great Recession, the Fed was correct to pull out all the stops, cut the federal funds interest rate to near-zero, assure that credit was available across financial markets, and use quantitative easing. The Fed closed down its organizations for emergency lending by 2011. It has started a slow process of reversing quantitative easing in October 2014. Steps toward raising the federal funds interest rate above zero seem likely to follow later in 2015.